During the turbulent days of 1972, Hanoi was seriously damaged by B52, and the citizens of Amsterdam (Netherlands) were so concerned about the city that they wanted to do something to show their support of the indomitable Vietnamese. The mayor of Amsterdam, Dr. Samkaden zealously encouraged Amsterdam's residents to donate the money with a view to presenting Hanoi with a well-equipped high school after the Victory Day. The result of that philanthropic and munificent is a newly- born Hanoi - Amsterdam, School for the gifted. - 81 students participated in the international-scale competitions for talented students which took place in Cuba, Germany, Russia, Australia, Austria, Bungari, China, Netherlands, Norway, Ukraina, Canada, Argentina, Turmenistan, Ireland, Asia Pacific and won 77 Gold, Silver, and Bronze Medals. - Our students have won over 1000 First, Second and Third Prizes in the national competitions and over 3500 prizes in the city competitions for gifted ones. - Students at Hanoi - Amsterdam high school not only possess a solid background of knowledge but also excel at social and cultural activities with a great number of awards and medals on both national and international scale. - Many of the school’s alumni have become professors, doctors, businessmen and philanthropists, devoting their talents to the development of the nation. - 7 teachers were nominated as 'Proficient educator,' the prestigious award for outstanding teachers. - Several teachers are the authors of highly assessed titles, as well as the leaders of inventive projects. Many of them were invited to join educational programmes by the VN Broadcasting Corporation, earning respects and love from students all over the country. - Annually, the crew win high prizes in the city's competition for excellent teachers. The school was given the great honour to welcome the President of Ministers, Mr. Pham Van Dong; the Supreme Commander, Mr. Vo Nguyen Giap; the Prime Minister, Mr. Phan Van Khai; the President Nguyen Minh Triet... and many other honourable guests. 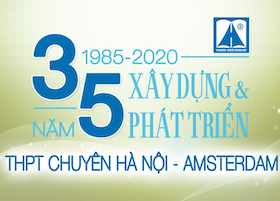 Being established and developed during the renovation of the country, for nearly 25 years, Hanoi - Amsterdam specialised high school has created itself a right direction to become the key specialised high school of the nation with international - standard quality!